First, a helpful disclaimer. The notion of “WeChat bots” is a bit of a red herring. Yes, bots do exist on WeChat, just not that many of them, and they don’t have a very central role in the overall user experience. What are bots used for on WeChat? 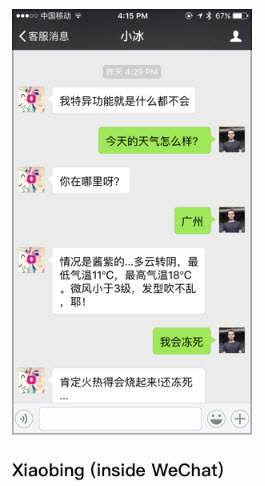 WeChat’s user experience in 2013 featured bots prominently. Since then, WeChat has moved its UX toward web views and an “app-within-an-app” display with tabs and menus, rather than focusing on the development of “conversational commerce” with bots at the center. This was surprising to me. In the United States, when bot mania really took hold of the technology world in early 2016, there was a notion that WeChat’s success, aided by bots, proved the viability of the bot technology model, with frequent discussion of which chat platform was going to become “the WeChat of the West”. This discussion seemed to imply that WeChat was overflowing with bots, transacting business, helping users, and generally pointing the way toward the future for messaging apps. In launching chat bots, U.S. companies took a page from huge social networks in Asia, where businesses have been able to insert themselves into the growing volume of conversation on texting platforms. On China’s WeChat, for instance, doctor’s appointments and shoe shopping can take place alongside conversations. It turns out this is a misunderstanding, at least in relation to bots. There are very few bots in China. While there are over 10,000,000 official accounts for organizations in China (similar to a Facebook page, but only available on a mobile device), the vast majority are menu-driven, not bot-driven. Where bots do exist they tend to be very shallow and only react to very specific keywords. Facebook is starting to look like WeChat official accounts did back in 2013. When WeChat first launched Official Accounts, a lot of them were text-based, with very simple graphics. They didn’t have the menus on the bottom yet. A lot of Official Accounts weren’t focused on the web view concept, and the “app-within-an-app”. But it quickly evolved into that, because the text-based chatbots just didn’t work out, and very few of them got much traction at all. In China the app-within-an-app is much more focused on web views than bots… Messenger should be thought of more as a shortcut, a link to a web view that can give a much broader, richer experience. Though bots have been fashionable, I’m not sure there’s evidence that real users actually prefer interacting with apps this way. I think Dan’s point is an excellent one. And I think it’s really interesting that two of the biggest messaging platforms on the planet are moving toward more app-like interactions. It also suggests, to me, that all the “AI” hype around bots is massively overblown. Add to this the mis-branding of bots as “chatbots”, which sets bad user expectations, and you have the perfect recipe for a promising technology that can’t (currently) deliver the “chatty-AI-knows-exactly-what-I-need” user experience that users are expecting. What are bots on WeChat doing today? Thousands of men in China refer to Xiaobing as their “virtual girlfriend”, but it’s really just a chatbot developed by Microsoft. Xiaobing is a precursor to Microsoft’s Tay, minus the racism. Microsoft describes her as “an emotional companion”, and she’s good enough at carrying on conversations that the average user talks to her 60 times per month. This is another example of the canonical “chatbot” model, where there is no “point” to the service other than to carry on a conversation, and pass time. Chumen Wenwen is an app that lives inside WhatsApp in the same way that Siri lives in an iPhone, and has very similar capabilities. You can ask Chumen Wenwen to find restaurants, movie times, and whatnot. Jiarui began developing WeChat bots about half a year ago to automate group management for her dance community on the messaging app. Her bot can automatically pull friends into groups and welcome new members, as well as hold basic conversations. But unsanctioned bots run amok on the social network, often tactlessly spamming groups or artificially inflating a brand’s likes and follows. The Chinese tech firm clamped down last year on thousands of accounts, denouncing the use of external software to alter WeChat. Tencent did not reply to queries about its policies on bots. So it seems like WeChat/Tencent see bots more as potentially malicious external software than they do as a central part of the technology or interaction model within the service. In fact, if you look at WeChat’s Developer documentation, the word “bot” is only mentioned 1 time. It’s on the Acceptable Use Policies page, discussing how it’s not allowed for bots to log into Official Accounts in order to verify certificates. So bots do exist in WeChat, just not that many of them. The ones that do exist tend to follow familiar patterns. Is this a realistic expectation? I don’t know. My guess is that it’s unlikely, at best. Forces specific to a market are hard to generalize out to other geographies. For instance, over 20% of WeChat users are also users of the WeChat Wallet feature, enabling all payments seamlessly inside the ecosystem. Hundreds of millions of Chinese consumers use the service for payments each month. Also consider that many Chinese users only get 500MB of data per month across 2G infrastructure. That means stripped-down “app-within-an-app” data delivery works much faster trying to access bloated web pages. Are those conditions ever going to be replicated in the U.S.? The market here is intentionally fractured. People self-select into whatever platform they feel attracted to. It’s hard to get all your close friends on the same messaging platform, much less get a substantial number to use mobile wallet functionality that makes the messaging app useful as a hub for commerce. In the U.S., only 12 million people use Apple Pay, the most popular mobile payment solution. Personally, I’d rather keep my money in a mattress than have a Facebook wallet, with them tracking every click I make and dollar I spend. And most data plans in the US *start* at 4X – 8X what an average Chinese user has access to. What WeChat has achieved can be much more instructively framed as an adept exploitation of Silicon Valley phone OS makers’ growing failure to fully serve users’ needs, particularly in other parts of the world. Chat apps have responded by evolving into “meta-platforms.” Many of the platform-like aspects they’ve taken on to plaster over gaps in the OS actually have little to do with the core chat functionality. Not only is “conversational UI” a red herring, but as we look more closely, we’ll even see places where conversational UI has breached its limits and broken down. WeChat bots exist, but in a very different context from what we’re accustomed to in the United States. WeChat is certainly showing how a “super-app” messaging client can expand to take over much of a nation’s attention on mobile. But they’re not doing it with bots, and it probably won’t be something that can be replicated.